marketable crops have been raised in geothermally heated greenhouses in Tunisia, Hungary, Russia, New Zealand, Japan, Iceland, China, and the United States. These include vegetables such as cucumbers and tomatoes, flowers (both potted and bedded), house plants, tree seed­lings, and cacti. Using geothermal energy for heating reduces operating costs (which can account for 35% of the product cost) and allows operation in colder climates where commercial greenhouses would not normally be economical. 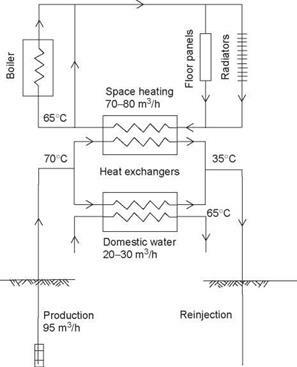 Space conditioning includes both heating and cool­ing. 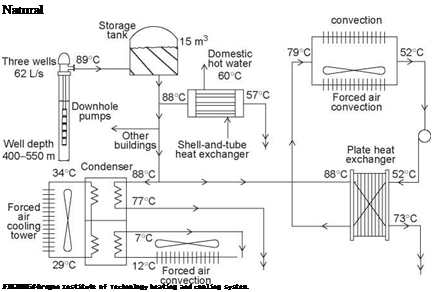 Space heating with geothermal energy has widespread application, especially on an individual basis. Buildings heated from individual wells are popular in Klamath Falls, Oregon; Reno, Nevada; and Taupo and Rotorua, New Zealand. Absorption space cooling with geothermal energy has not been popular because of the high temperature require­ments and low efficiency. Geothermal heat pumps (groundwater and ground coupled) have become popular in the United States, Sweden, and Switzer­land for both heating and cooling. Romans, Chinese, Ottomans, Japanese, and central Europeans have bathed in geothermal waters for centuries. Today, more than 2200 hot springs resorts in Japan draw 100 million guests every year, and the “return-to-nature’’ movement in the United States has revitalized many hot spring resorts. agribusiness application Agriculture and aquaculture de­velopments; in this article, it includes the heating of the various applications, such as greenhouses and fish ponds. aquaculture pond/raceway heating Heat energy provided to ponds and raceway in order to optimize the growing of fish, shrimp, alligators, or other aquatic species. balneology The use of mineral waters for therapeutic purposes. OPEC’s ability to raise prices in the short run to levels that may be damaging to the economies of major consuming countries poses a major policy challenge to the governments of consuming coun­tries. Rising oil prices threaten consumer country national interest in several ways. Oil price volatility can inhibit investment, inhibit economic growth, and spur inflation in major economies that purchase consumer country exports. The burden of rising energy import costs also threatens social stability in key regional consuming countries such as India and Pakistan and the South­east Asia region. Moreover, supply constraints also make it easier for governments or subnational groups to threaten vital interests of the United States, Japan, and their allies. Over the past few years, there has been a dramatic shift in the internal politics of OPEC, reflecting changes of political leadership at the highest levels and of broader policies of key members. The result has been greater cohesion inside the producer group and a clearer articulation and implementation of goals and aspirations.